Happy weekend everyone! 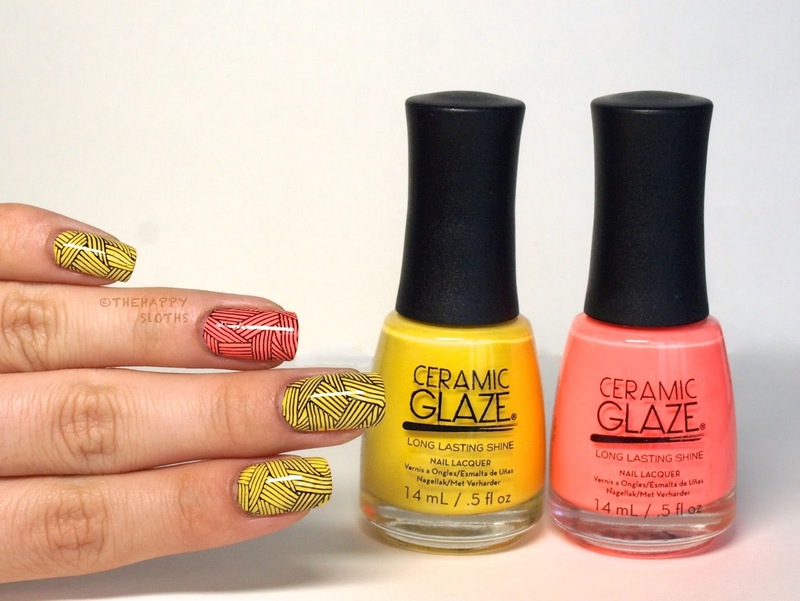 I feel a bit nail art deprived lately so I went a little stamp-crazy a couple days ago and here is a fun and bright summer mani I came up with using a couple of new Ceramic Glaze Summer 2014 polishes. For my mani, I used Ceramic Glaze's "My Dance Card's Full" as the main color and "I'm on Island Time" as the accent color on the ring finger. The stamping design is done with MoYou London's Fairy Tale plate and "Hassid" from American Apparel (my favorite black polish for stamping). A bright and rich yellow cream, this polish is quite opaque compared to most other yellows I have tried. The formulation was a bit runny so I experienced some "cuticle flooding". Opacity can be achieved in two coats if you are skillful, but I had to use three. This one is a very bright pastel neon coral (apparently that's a thing, pastel neons). The polish dries quite matte and I needed three coats for opacity. I also noticed that after adding a top coat the color dulled down a bit. Formulation is decent, but it's quite similar to your typical neons, not very self leveling but fast drying. 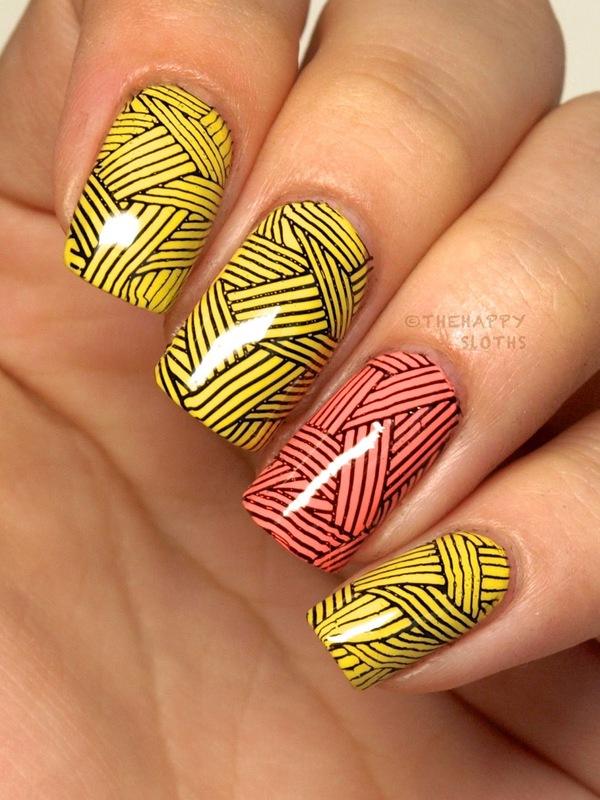 I really like how the manicure turned out, the black stands out against the yellow and coral really well! Also I think this may have been my fifth time using this particular stamping design, I don't know why but I love it so much, it virtually goes with every color! Ceramic Glaze polishes are available at Shopper Drug Mart and Pharmaprix in Canada for $10.99 each. Moyou London is available online. Do you like my bright summer manicure? 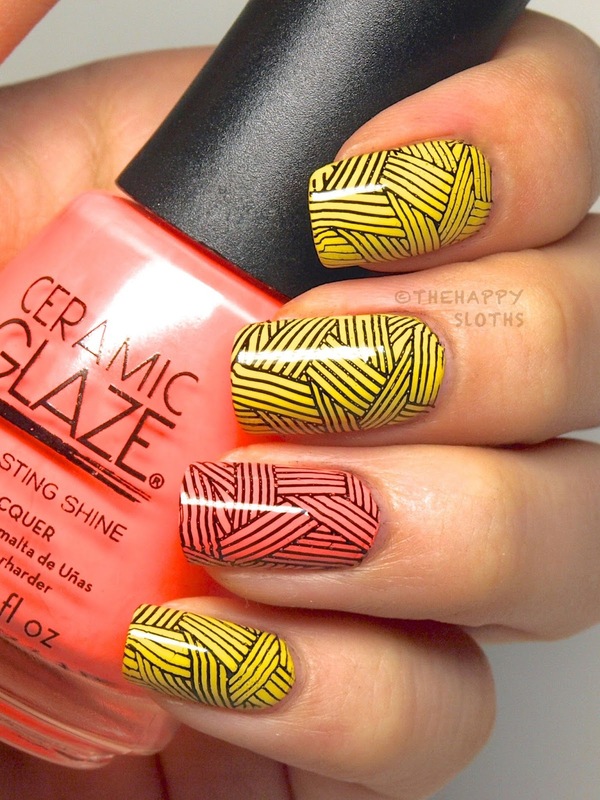 Do you have a stamping design that you love so much you just want to use it for every mani?